The game board itself is simply a 9 patch block and the game pieces are made the same way I made the Play Alphabet letters. 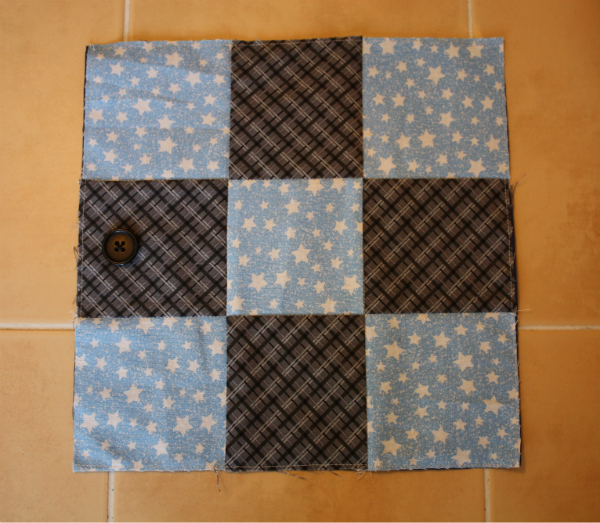 5 squares 3 1/2" x 3 1/2" from one of the fabrics for the front. 4 squares 3 1/2" x 3 1/2" from the other fabric for the front. 1 square 9 1/2" x 9 1/2" from the backing fabric. 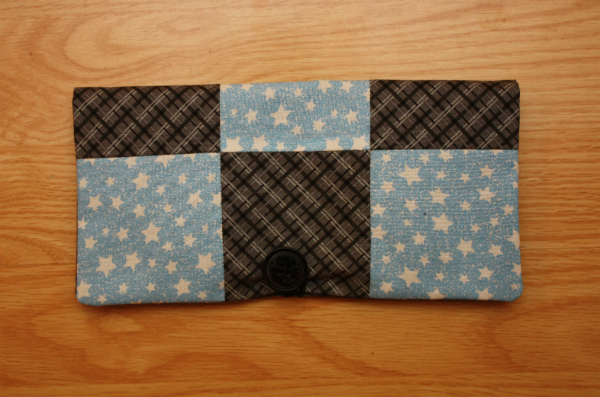 2 rectangles 6 " x 9 1/2" from the backing fabric. 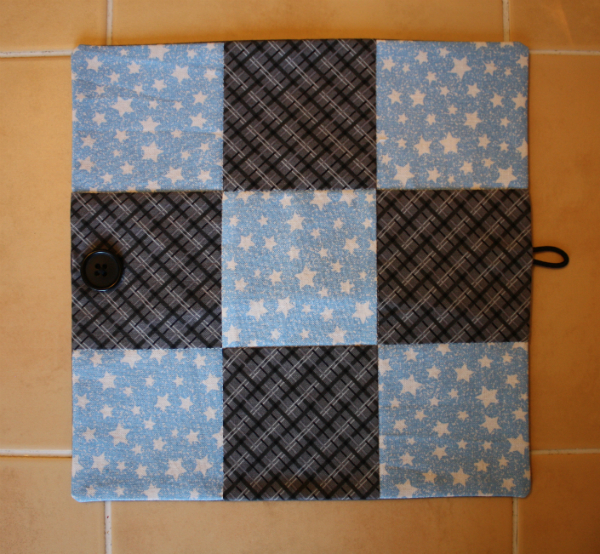 Arrange the 3 1/2" x 3 1/2" squares in three rows of three as shown. 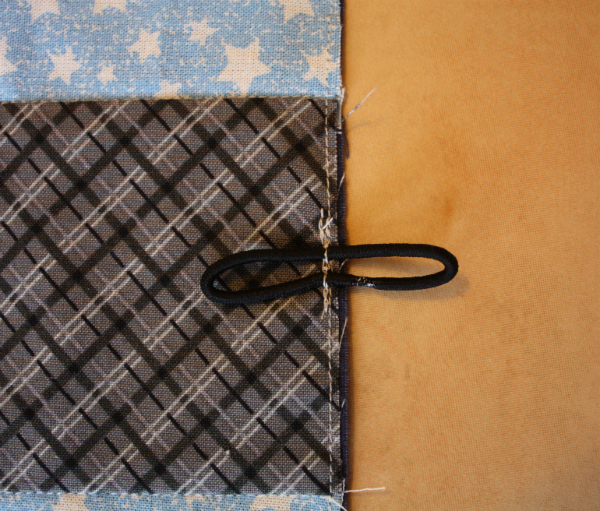 Join the squares into rows, pressing the seams toward the darker fabric. Join the rows to make the 9 patch block. 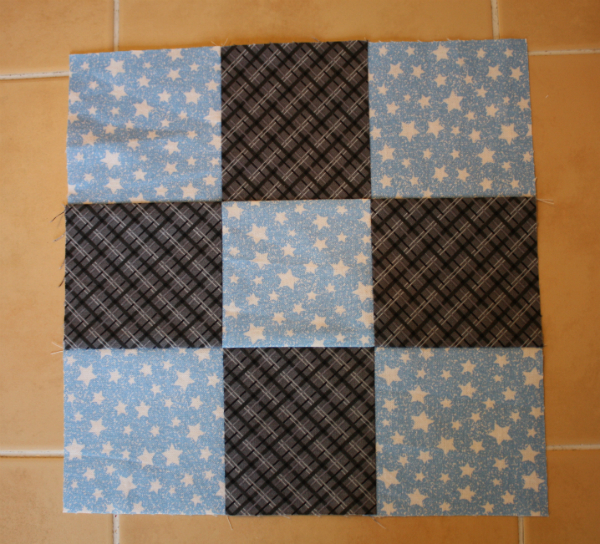 Layer the 9 patch block with the 9 1/2" square of backing fabric, wrong sides together. Pin to secure. 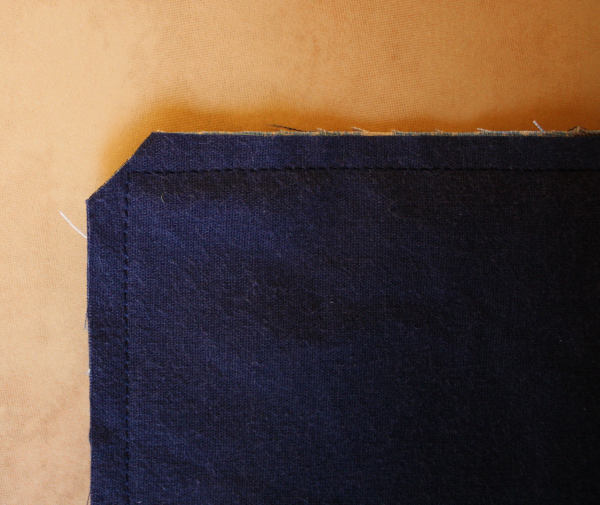 To secure the layers, stitch in the ditch of each seam. Then stitch around the whole edge of the block, about 1/8" from the edge. This will create a finished back for the front of the game board so there are no raw edges exposed. Position the button in the middle of one side, far enough from the edge that your presser foot will be able to stitch a 1/4" seam beside it. Hand stitch the button in place. On the side opposite the button, position the hair elastic so half of it extends past the edge of the block. Machine stitch in place, going over the elastic a couple of times to secure it. 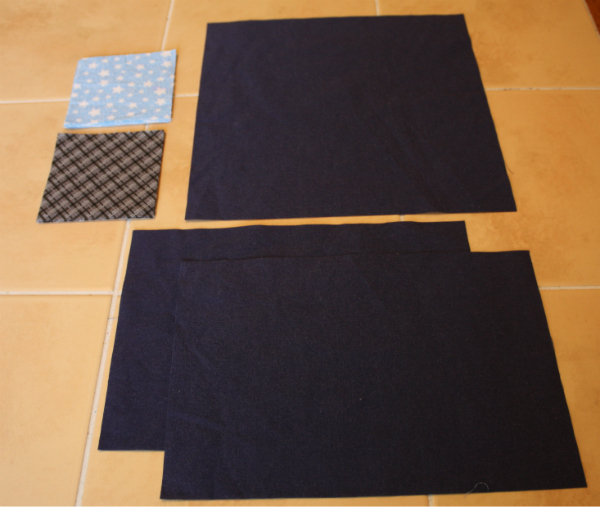 On one long side of each of the backing fabric 6" x 9 1/2" rectangles, fold 1/4" towards the wrong side and press. 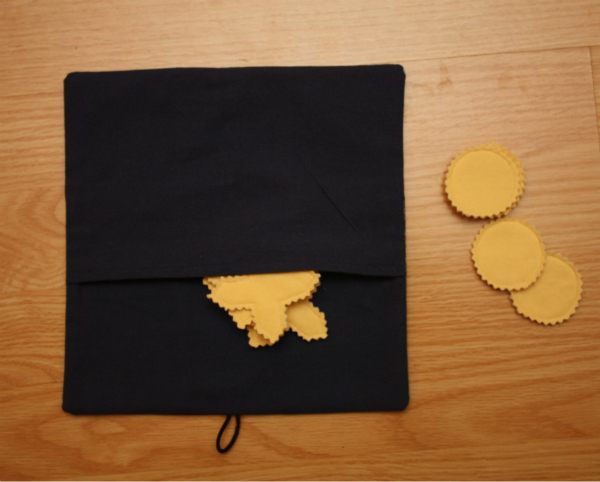 Then fold over 1/4" and press again. 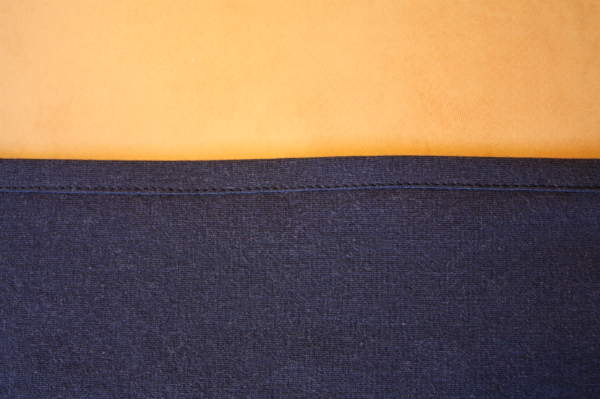 Stitch close to the folded edge. Position the 9 patch block on your work surface, right side up. 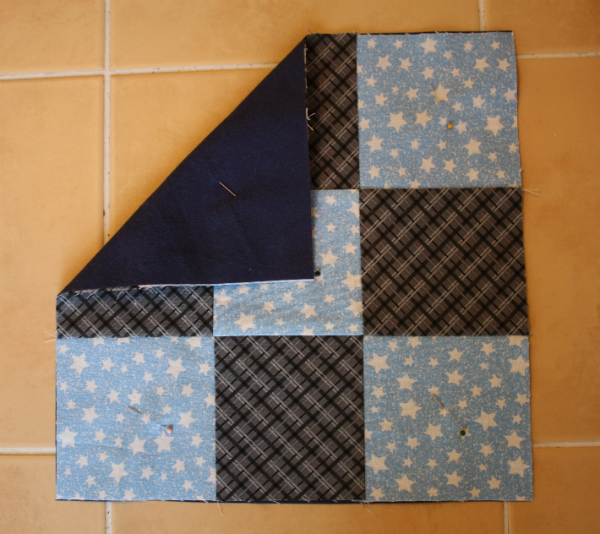 Lay one backing rectangle on top, right sides together, with the finished edge of the rectangle across the middle of the block. 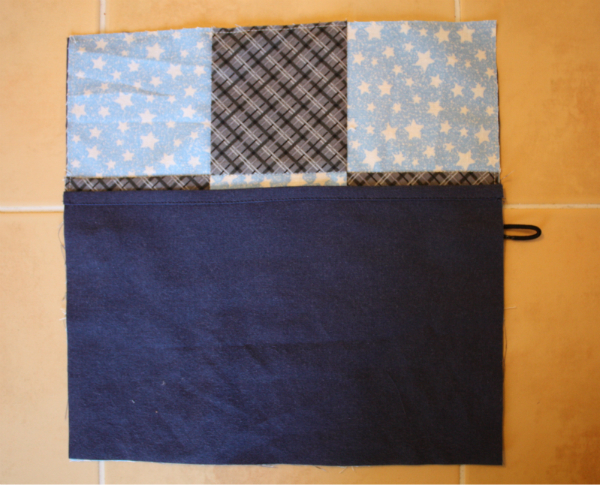 Then lay the other backing rectangle on top, again right sides together with the 9 patch block and overlapping the finished edges of the two rectangles.Pin all the way around. I added an extra pin beside the button to remind myself to be careful as I stitched past it. 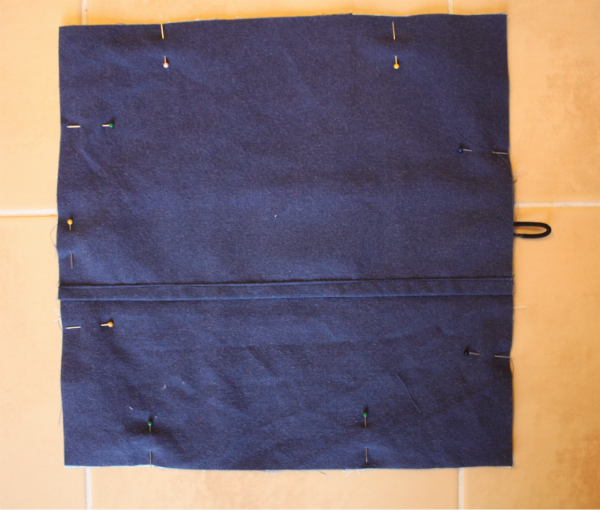 Stitch all the way around the perimeter and trim the corners. Turn the game board right side out through the opening in the backing and poke out the corners. Press. 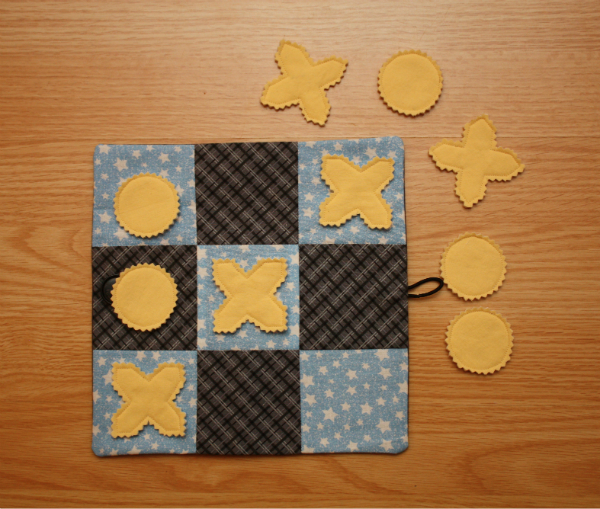 To close the game board, simply fold in half and secure the elastic around the button. Voila! 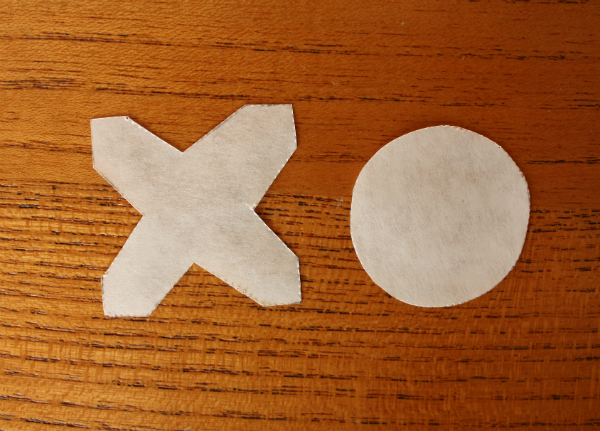 To make the game pieces using my freezer paper method, see the tutorial for my Play Alphabet. To make my game piece templates, I traced around a thread spool for the O pieces and for the X pieces I drew a square, then cut a notch out of each side. Remember that your game pieces will be slightly larger than your templates because of the pinked edge. 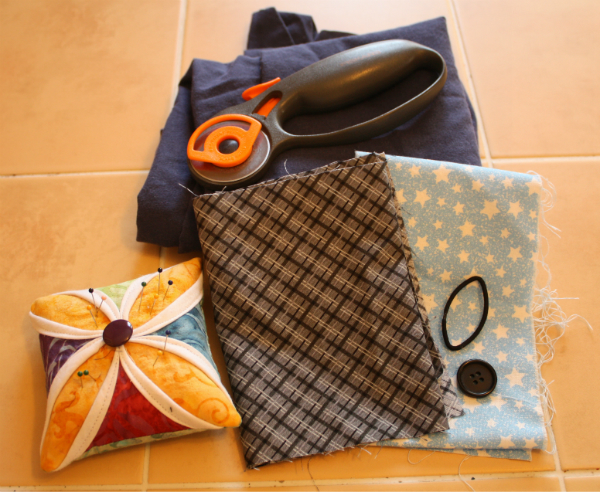 The pieces can be stored in the pouch at the back, and they won't fall out when the board is folded and the elastic is secured around the button. 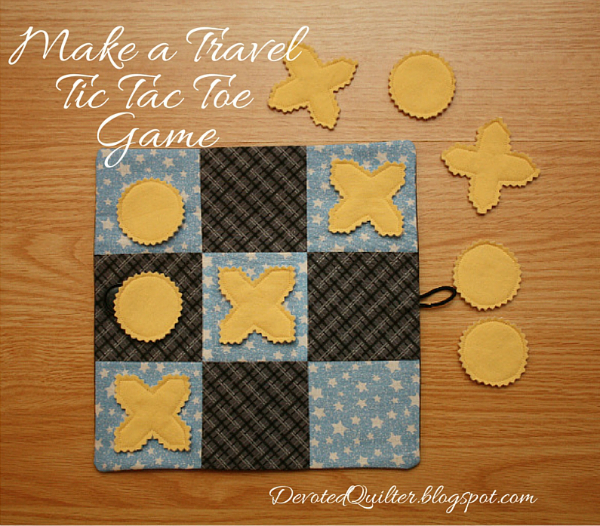 If you make a travel tic tac toe game using this tutorial, I'd love to see it! You can email a picture or a blog post link to devotedquilter at gmail dot com, or tag me on Instagram (@devotedquilter). I could have done with this years ago Leanne! I'm thinking this may work out in my future. Great idea Leanne. What a neat idea. Good way to occupy yourself during travel. This is such a great idea. I love that it has a pocket for the pieces and flat to keep them safe. Thank you for the tutorial on how to make it. Great idea and thanks for sharing a tutorial for it. My grandson loves playing this so I might have to make him one. What a cute idea! And so simple. Thanks for the tutorial!